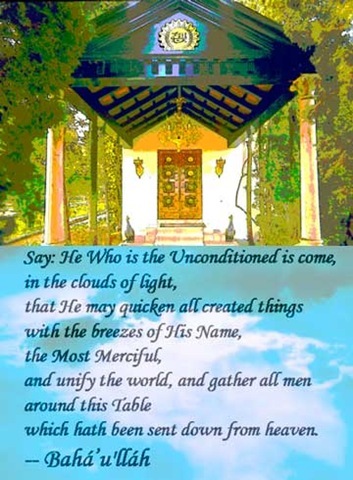 Say: He Who is the Unconditioned is come, in the clouds of light, that He may quicken all created things with the breezes of His Name, the Most Merciful, and unify the world, and gather all men around this Table which hath been sent down from heaven. Beware that ye deny not the favor of God after it hath been sent down unto you. Better is this for you than that which ye possess; for that which is yours perisheth, whilst that which is with God endureth. He, in truth, ordaineth what He pleaseth. Verily, the breezes of forgiveness have been wafted from the direction of your Lord, the God of Mercy; whoso turneth thereunto, shall be cleansed of his sins, and of all pain and sickness. Happy the man that hath turned towards them, and woe betide him that hath turned aside. 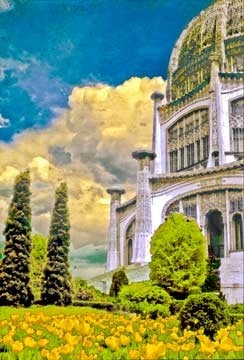 Download a compilation about symbolic clouds drawn from the Bahá’í Writings.